Also, be on the lookout for bone issues. When your body is in a state of “functioning” low magnesium, the body will strip magnesium from bone to utilize it in other biochemical reactions which can cause damage to the bones. If this is occurring, testing for magnesium levels will likely return normal, which can lead to a missed diagnosis. 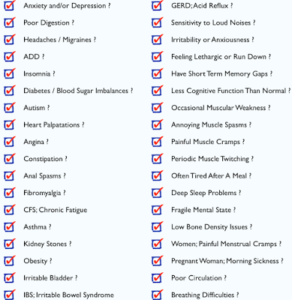 Conditions commonly associated with magnesium deficiency include depression, chronic fatigue syndrome, ADHD, epilepsy, Parkinson’s disease, sleep problems, migraine headaches, cluster headaches, osteoporosis, premenstrual syndrome (PMS), chest pain (angina), cardiac arrhythmias (irregular heartbeat), coronary artery disease or atherosclerosis, hypertension, type II diabetes, and asthma. The presence of any of these conditions could point to chronic hypomagnesemia (low magnesium). So…after about a week of taking magnesium supplements, my original symptoms of heart palpitations, decreased blood pressure and increased heart rate have all practically disappeared. I guess the doctors got it right. 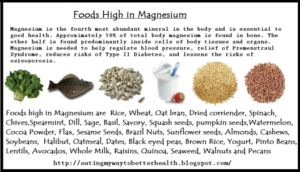 I will continue to supplement magnesium in order to keep my body running as efficiently as possible. 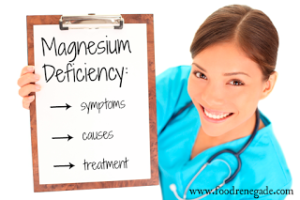 If you think that you may have a magnesium deficiency, talk to your doctor before you start taking supplements to confirm that is the problem. I wouldn’t want any of you taking supplements unnecessarily.